Take advantage of ordinary food items in your refrigerator. Photograph close-up shots of fruit and vegetables. Outline and knock out the backgrounds in Photoshop, adjust the color density and then add these images to your newsletter. 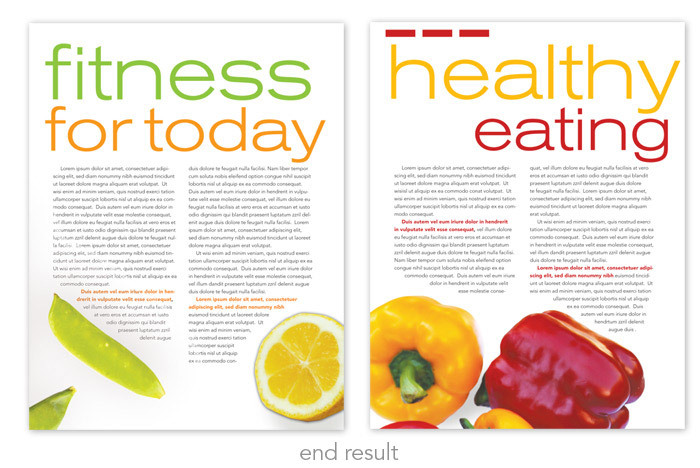 Wrap text around the fruit vegetables or place these elements at the corners of the page. We have included some examples below. Including photos of fruit and vegetables adds color and interesting shapes to an otherwise static newsletter. You’ll be pleased with the results and how easy this is to do. And then you can have fun eating your visual enhancements as well. What fun! This entry was posted in Newsletters and tagged design, elegant design, fitness nutrition, food items, fruit and vegetables, fruit vegetables, layout, photography, Photoshop, refrigerator, visual enhancements by Successful Corporate Communications. Bookmark the permalink.